A Leeds court has given ailing supermarket chain Kwik Save more time to reach a decision on its future. The company secured an adjournment to give Kwik Save directors more time to develop a refinancing plan. Kwik Save wants to "save many jobs" that might otherwise be at risk if the firm goes into liquidation, and some 3,000 staff could be affected. On Thursday Kwik Save said 22 stores would be closed, including those in Dunstable, Bristol and Wakefield. The firm had announced plans to close 70 stores in May, before later saying it would reopen 19 outlets. 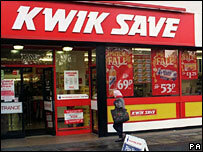 The future of Kwik Save has been uncertain since new management took over the company some 10 weeks ago. "Since the business was taken over by new management, there has been considerable time and capital injected," the firm said after the court decision. "However, it became evident that unless the business was restructured, additional funding would not be forthcoming and it would not have a strong financial future." Struggling Kwik Save - formerly part of the Somerfield supermarket group - was sold by Somerfield's owners in 2006 to a new firm BTTF. Around a third of the firm's stores have been closed across the UK, entailing some 700 job losses. After Thursday's decision, 145 outlets will remain open.